Two University of North Texas biology students recently earned prestigious national research placements for their stand-out undergraduate research work. 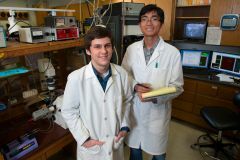 Zane Gibbs and Son Le, both undergraduate biology students in the University of North Texas Howard Hughes Medical Institute Program, earned placements in the national Howard Hughes Medical Institute. The program is an exclusive one that seeks to support the next generation of researchers, with a particular focus on underrepresented backgrounds. Gibbs and Le were two of only eighty students across the entire U.S. who were chosen for this year’s program. The Exceptional Research Opportunities Program has placed Le with Eric Gouaux at Oregon Health & Science University. He will assist Dr. Gouaux on a project that is “investigating the molecular mechanisms of communication between nerve cells by studying the receptors and transporters that detect and remove neurotransmitters from synapses, which are the site of nerve cell communication,” according to a school news release. Currently, Le’s is studying under research mentor Dr. Guenter W. Gross in UNT’s Biology department. Gibbs, who is currently studying with UNT is Associate Professor of Biology Lee Hughes, has been placed at the University of Colorado at Boulder. There he will work with Associate Professor Joaquin Espinosa on a cancer research involving the study of a tumor suppressor gene. More information about the research program can be found online.